Friends, I call it a salad.. but it indeed is a complete lite dinner or lunch with portion of lean protein, lots of veggies, herbs as well as carbs. 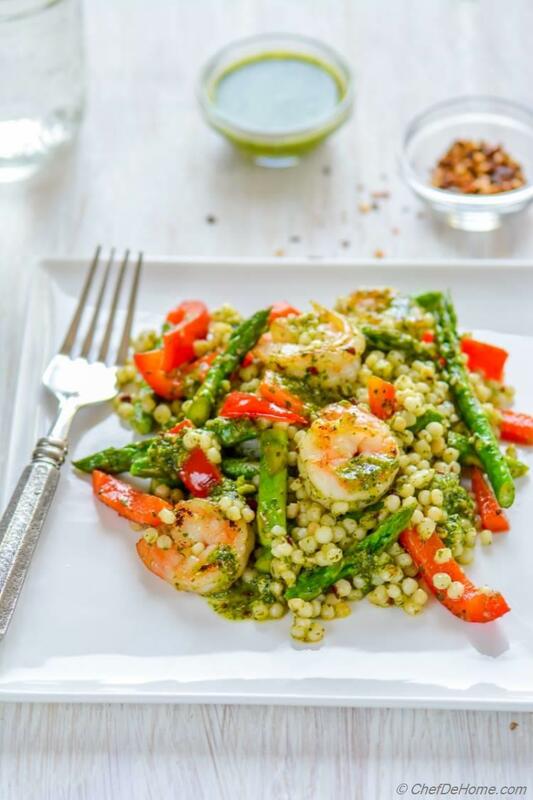 Can you believe this three-component (grilled shrimp, chimichurri sauce, couscous pasta) recipe needs only 20 minutes, start to finish! Oh yes! 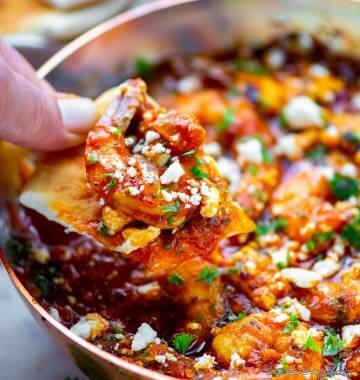 That's comfort of cooking with shrimp! By the time, couscous cook in boiling water, shrimp and veggies are ready on grill. And chimichurri sauce? It needs no cooking at all. Keep a food processor ready, sauce will be ready under 1 minute, max. Oh, this salad can be served at room temperature (when just cooked) or cold. You can prepare it a day in advance which makes it perfect to bring to potlucks or grilling parties. Honestly, I'm always testing recipes to make delicious, zesty and fresh salads. No wonder this colorful week needed one salad at-least, may be two :) j/k. Today's salad is as special in flavors as it is colors. 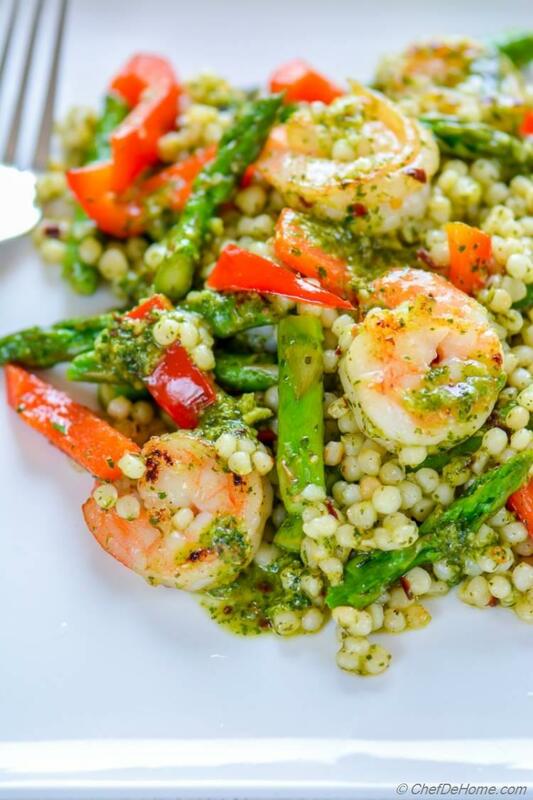 The zing of chimmichurri sauce with nutty Isarali Couscous and lite grilled shrimp... everything compliments each other so so well! Chimichurri or chimmichurri is a tangy herbaceous green sauce served with grilled meats,. It's basic preparation ingredients are finely-chopped parsley, minced garlic, olive oil, and lemon juice. I decided to add a little zing in the basic preparation with some fresh mint and chili flakes. Actually, I found this sauce even better than classic chimichurri! First time we tried Chimichurri in local Mediterranean Fusion restaurant with some grilled lamb chops. Actually, I have mostly seen Chimichurri served with grilled meats since it's lite and fresh flavors compliment fatty meats very well. However, seafood is yet another protein which goes very well with lemony-herbaceous condiments. So I decided to replace lamb chops with lean shrimp. To further reduce fat I have only grilled shrimp without much oil. I'm sure a taste of this zesty salad and you will be making it many times. I suggest to double the recipe for Chimichurri to help extra cravings. Even though this shrimp salad comes together in just 20 minutes.... I prefer to make chimichurri sauce a night before. If we in mood to eat shrimp for dinner, I just cook pasta and grill some shrimp and veggies while pasta cooks. (if not grilling, roasting in oven or pan saute in little oil works well too). 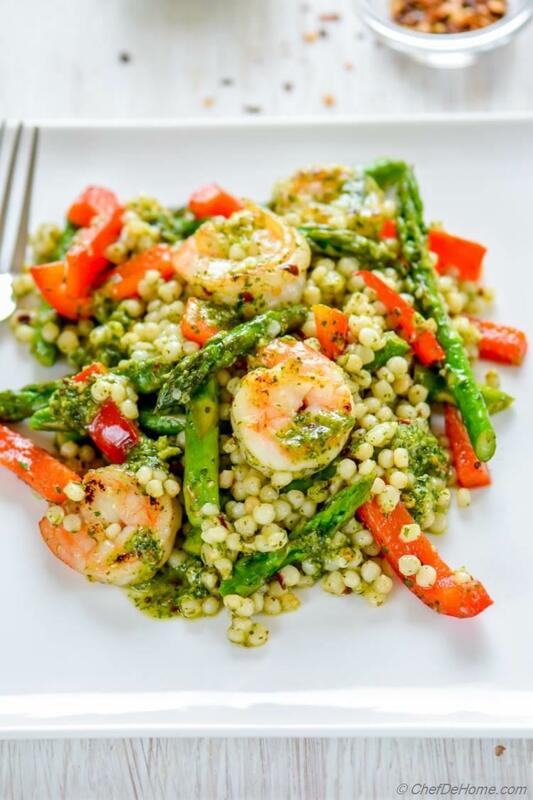 Mixing in cooked shrimp and veggies with nutty silky couscous pasta and chimichurri sauce... in 15 minutes delicious dinner salad is ready to devour. This salad tastes good served room temperature or chilled. To pack for potluck parties, it can be made ahead and refrigerated overnight. Total Time 20 minutes Prep Time 5 minutes Cook Time 15 minutes Difficulty Easy Yields 4 - 1 Cup Servings Serves 4 Notes 2 substantial servings or 4 of 1 cup servings. 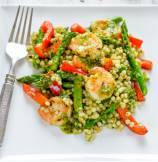 Smart Swap Replace couscous with Wild Rice or Quinoa to make this salad gluten free. 1. Bring pot of water to rolling boil, season with salt and cook couscous until just al-dente (7-10 minutes). Or follow direction of cooking couscous pasta package. 2. While couscous is cooking, in a food processor jar, combine all Chimmichuri ingredients and puree to a smooth green sauce. Transfer to a bowl and set aside. 3. Once couscous has cooked, transfer it to a wide mixing bowl, add half of the Chimmichuri, toss well and set aside. 4. Preheat a gas grill or a cast iron grill pan. Season shrimp with salt and pepper. Spray grill with oil, grill shrimp and vegetables until shrimp curled and pink with no sign of opaque (about 1-2 minute each side) and vegetables are crisp tender. Remove into bowl with couscous. 5. Rough chop the grilled vegetables. 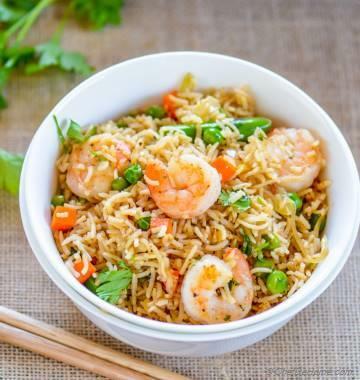 Remove into same bowl with couscous and shrimp. Toss well. Add remaining sauce on top. Serve cold or at room temperature, either in big bowl or transfer to small plates. Serve and enjoy! Hi Barb, mint gives distinct flavor to Chimichuri. But, I agree mint is not everyone's taste. You can actually skip mint and use all parsley instead. I often make Chimichuri with all parsley. So, I know it will be good. Basil should be okay too but I have never used it in this recipe. I hope it helps. Hello Sandee, you are right. If you making salad a night before, mix in half of the dressing. Since couscous is form of pasta, without dressing pearls will stick to each other and at the same time it will also absorb some liquid when sitting overnight in dressing. So half dressing will keep salad perfect overnight and you can mix in rest next day/before serving. Also, I mostly keep cooked shrimp separate and mix it in before serving. I hope it helps. Love serving Shrimp for dinner. I'm so tempted o try this recipe. thanks, Gina! 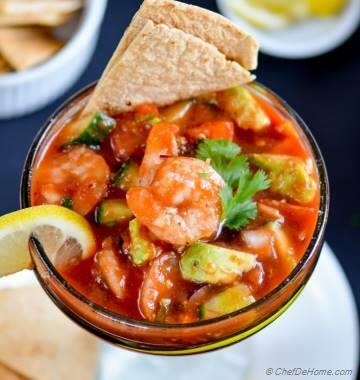 If love shrimp, you will really like this recipe. I hope you get chance to try it.